The opportunities and challenges of utilising Earth observation (EO) data played out in microcosm in our house over the weekend. On Sunday afternoon, I was watching highlights of the Formula One Singapore Grand Prix which takes place on the harbour streets of Marina Bay and is the only night race of the season. To ensure the drivers can see, there are over 1,500 light projectors installed around the circuit giving an illumination of around 3,000 lux. Whilst watching I wondered aloud whether we’d be able to see the track from space with the additional floodlights. My idle wondering caught Sam’s interest far more than the actual race and she decided to see if she could answer the question. The entire circuit is just over five kilometres long, but it’s a loop and so an approximate two kilometre footprint; any imagery would need a spatial resolution less than this. The final difficulty is that the data needed to be this weekend, as the circuit is only floodlit for the racing. Within a few laps Sam had identified free near real time night data available from United States National Oceanic & Atmospheric Administration (NOAA) which covered the required area and timeframe. This was from the Visible Infrared Imaging Radiometer Suite (VIIRS) using it’s Day/Night band with a 750m spatial resolution – this resolution meant we would not be able to see the outline of the track as it would be represented by only three or four pixels, but it would be interesting to see if we could identify the track feature. By the end of the race Sam had selected and downloaded the data, and so we could answer my question. However, it turned out to be not quite that easy. NOAA data uses a slightly different format to the image processing packages we had, and we couldn’t initially see what we’d downloaded. Sam had to write some computer code to modify the packages to read the NOAA data. For anyone thinking this is an odd way to spend a Sunday evening, to Sam this was a puzzle to solve and she was enjoying herself! After some rapid coding we were able to view the image, but unfortunately the Saturday data wasn’t useful. On Monday we tried again, the Sunday race took place on a clear night and we’ve got a good image of the area, which you can see above. 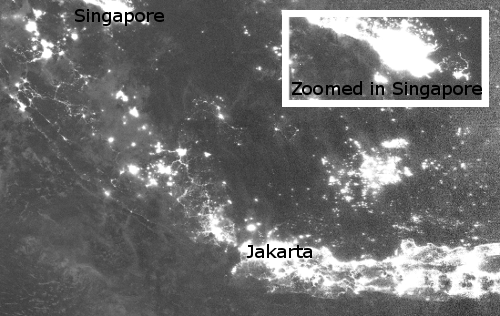 On the larger image you can clearly the Indonesian Islands with Jakarta shining brightly, up through the Java Sea where the lights of some ships are visible and then at the top of the image is Singapore; the zoomed in version of Singapore is the inset image. Despite the floodlights used for the race, Singapore and some of the surrounding Malaysian cities are so bright at night that the additional lights simply contribute to the overall illumination, rather than making the track stand out. Hence the answer to my question is that the 2014 floodlit Singapore F1 street circuit can’t be distinguished from the surrounding area at this spatial resolution. Of course if we purchased high resolution imagery we may be able to see more detail, but we thought that was going a bit far for my idle wondering! EO can answer questions like these quickly; and whilst we know not many businesses are dependent on whether the Singapore Grand Prix can be seen from space, but change this to what is the light pollution in your area, what is happening in terms of deforestation in the middle of the jungle, what phytoplankton are doing in the middle of the ocean or whatever question you might have, then EO might be able to provide the answer in a short space of time. However, there are two main difficulties in getting the answer. Firstly, you’ve got to know where to find the data and secondly, what do with it when you get it. Currently this can be challenging without specialist knowledge, making it inaccessible for the general population. In the coming weeks, we’re going to write some blogs looking at the freely EO data available, and the easiest way of viewing it. Hopefully, this may to help you answer your own questions. In the meantime if you have questions you want answered, get in touch, we’d be happy to help. This entry was posted in Data, Earth Observation, Remote Sensing, Space Can Help, Uncategorized, Understanding Space, visualisation and tagged Earth Observation, F1, floodlights, floodlit, Formula One, Jakarta, light pollution, NOAA, pixalytics, puzzles, Singapore Grand Prix, spatial resolution, street circuit, track, visibility by Andy. Bookmark the permalink.